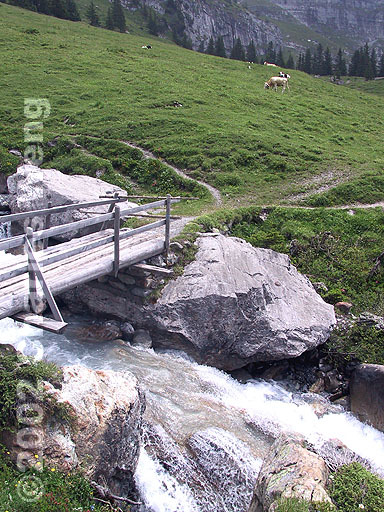 Trümmelbach -- The halfway point of the hike from Kleine Scheidegg to Wengen is a glancing view of the Trümmelbach, one of the many glacial runoffs that finds its way via brooks and falls down the Lauterbrunnen valley. 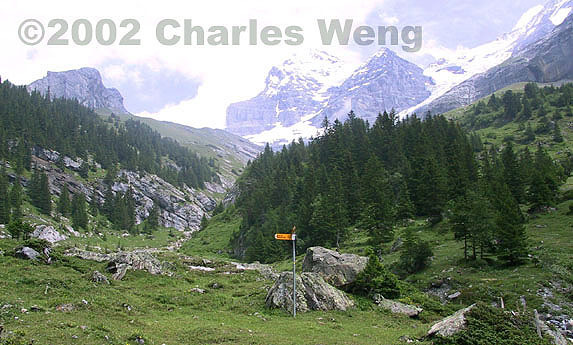 Here, the hiker gladly takes a rest after descending the plateau looking towards the Lauberhorn (seen at upper left); while not so steep, the broken granite that keeps the path intact can be quite punishing to the feet. At this point, the hiker has already skipped the easier way back to Wengen via the aerial gondola from Männlichen, bracing for 2 km of sharp switchbacks through the forest of firs and ferns.